Graphs at a glance: East Coast Mainline. Why is the government so quiet about one of its greatest success stories? You would have thought a company delivering record levels of cash to the taxpayer would have something to boast about. Surely its bosses would want to crow about how they turned around a failing franchise that had been abandoned by the previous two franchisees. You’d think they would use this laudable fact to justify a round of plump bonuses and a topping payrise. And yet they are strangely silent. If you thought they were hoping nobody would notice their successes, you’d be right. To be more precise, their owner doesn't want anybody to notice their successes. This secretive organisation is the East Coast Mainline Company Ltd (East Coast). East Coast is the government owned Train Operation Company (TOC) that took over the nationalised East Coast Mainline after that franchise was abandoned by the private sector, first by GNER (2007) and then by National Express (2009). It is a company celebrated in the Guardian and the Daily Mail for returning a whopping £1billion to the taxpayer since the franchise was nationalised in 2009. And yet its bashful bosses box on, according to their annual report, on their modest Civil Servant salaries (East Coast CEO earned £224.8k in 2013. Peanuts compared to CEOs of similar sized companies (FTSE250 CEO average pay = £1.3 million) and with no bonuses and no share options . (10th Aug) Donna Tart (TV personality) launching“I love trains” week. (1st Aug) Launch of its “bold new” website. So why does East Coast cover its triumphs under a layer of soot and cinders worthy of Thomas the Tank Engine on wet straw? The smoke surrounding this mystery clears when you consider East Coast is a subsidiary of Directly Operated Railways, which is itself a wholly owned subsidiary of the Department for Transport. 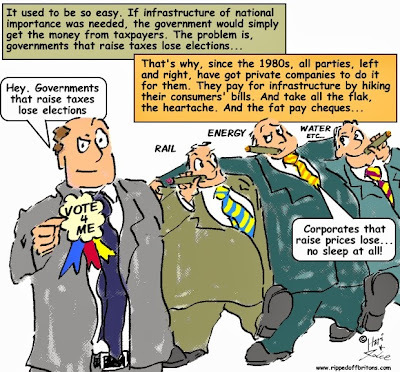 The success of East Coast is nothing less than a shower of hot coals on the heads of a succession of Labour and Tory Transport ministers since privatisation started in 1993. It is an accidental head to head collision between public and private sectors that the public sector embarrassingly won. This whole thing is a terrible embarrassment for both Labour and Tory. But particularly for the Tories, who are running the competition to re-privatise East Coast, as well as renewing several other franchises in the 2015 election year. The Department for Transport said that the operator would be forced to improve services while its subsidy would be cut. But the deal was met with dismay by passenger groups and unions who described it as a "reward for failure". Stagecoach and Virgin win East Coast mainline rail franchise. What is the relationship between the DfT, Permanent Secretary Philip Rutnam, and Govia, the parent company of Southern Trains and Southeastern Trains? The DfT awarded a direct, four year franchise in September to Govia, without going to competitive tender, even though Southern and Southeastern are the worst performing companies in the network. Secondly, the DfT allows Govia to run the penalty fares appeals service, IPFAS, which is supposed to be independent of the rail companies, and seen to be independent of them. This is against all the regulatory requirements. Nick Bisson, when Director for Rail Policy, eventually admitted that Govia and its executives personally make money every time IPFAS turns down an appeal against a penalty fare that Govia has imposed – and he justified it on the basis that compared with the billions in the rail budget, it wasn't significant! The DfT doesn't even audit IPFAS, which it is required to do by law, and so doesn't know how much money IPFAS makes for Govia – and Nick Bisson certainly has no idea how many appeals are lodged and how many are upheld. Why does the DfT allow Govia to do this and to act in a totally secret way? The DfT also still regularly states that IPFAS is a separate business unit within Southeastern which it definitely isn’t – even though the DfT has actually admitted time and time again that it is run as an integral part of Southeastern. The DfT knows that Southern Trains supplied misleading evidence about one appeal – and refuses to act – presumably because of the special relationship with Govia. The DfT knows that Govia doesn’t apply the secret discretion rules over penalty fares – and refuses to act – and it refuses to publish the discretion rules to prevent as much as possible any scrutiny of Govia’s activities. Why does the DfT go out of its way to protect Govia and its executives like Charles Horton,, MD of Southeastern, from proper scrutiny? As a word of warning - what did the DfT do when I started my campaign to expose their failures to carry out their statutory, regulatory and legal obligations? In addition to using abusive and foul language about me - for which I have never had an apology so it is obviously standard practice under Philip Rutnam, they attempted dirty tricks. The DfT wrote to an ex-civil servant attempting to get that person to write to the press rubbishing me. (Nick Bisson said that as it was an individual who wrote the email doing that - have you ever heard of an email not written by an individual? - it wasn't the DfT and refused to apologise for DfT's wrong doing.) The DfT will stoop to any levels to irritate and annoy and block any complaints - and they think because they have always got away with it, they are untouchable. It was, for example, agreed that I wouldn't have to deal with Jeremy Hotchkiss, DfT,who had deliberately not answered my complaints. Who contacted me about the new consultation process? Jeremy Hotchkiss - the DfT loves to provoke people. There is something seriously wrong here. Another piece of advice when appealing to IPFAS. Penlaty fares are applied under strict liability. (Govia just loves invoking that - as it stops them having to prove anything - they think.) In fact, under strict liability they have to be able to prove that all signage and information is avalaiable on the train in question. They can't - or won't. (In my case my son had inadvertently sat in first class - which is exactly the same as standard class, doesn't have doors on the compartment, and all the signage gets torn off regularly - and Southern sent photos to Passenger Focus of a completly different train, with, for example, doors on first class, to "prove" that they are squeaky clean. Challenge the company to produce evidence that the signage was there. Then challenge the DfT to show that it has audited the way the appeal was dealt with. (The DfT will fob you off with similar, untrue statements to these it gave me: "IPFAS is run as a separate business unit within Southeastern Trains"; DfT is not responsible for auditing or regulating penalty fares and the appeals; the DfT is satisfied that IPFAS addresses appeals properly (this last is laughable because the DfT does NOTHING to audit or regulate IPFAS, as it has admitted to me - it doesn't even know how many appeals are lodge!). When your appeal is turned down - wrongly in my case, as was never admitted but they did have a second attempt having got it wrong the first time - write to philip.rutnam@dft.gsi.gov.uk and complain that he is not carrying out his statutory and regulatory duty and that he is allowing Govia and its executives to make money unfairly. You will no doubt then receive the abuse I received - but something has to be done about this cosy and unfair relationship between the DfT and Govia. "Virgin Trains East Coast has been accused of imposing a near 100% fare rise “through the back door” after pulling many of its cheapest advance fares on popular routes. In March 2015 a new consortium took over the east coast rail franchise with a promise by the then transport minister that the deal would be “fantastic” for both customers and staff. But the new operator, which is 90% owned by Stagecoach but prominently features Virgin’s branding, has in effect doubled some passengers’ journey costs by removing the cheapest advance fares."